Rodin College House was built in 1971-72, following the University's decision to place a mixture of skyscraper apartment buildings and low-rise dormitories on the newly acquired land between 38th and 40th Streets. T-shaped in plan, with a boldly massed rear facade in which the top floors appear to stand on tall columns of glass, Rodin and its two skyscraper sisters, Harnwell and Harrison, were designed by G. Holmes Perkins, Dean of the Graduate School of Fine Arts, now the School of Design, from 1951 to 1971. Dean Perkins assembled the stellar team of architects to work on the project, including Louis I. Kahn, who propelled Penn to the top of the list of American architecture schools in the 1960s. 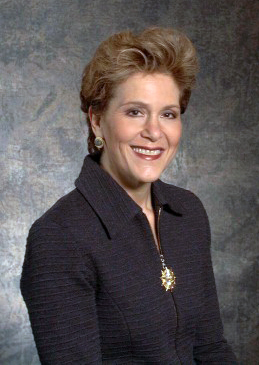 Rodin College House is named in honor of Dr. Judith Rodin, who stepped down as president of Penn in June 2004 after a decade-long tenure. Dr. Rodin was directly involved with the renovations to the building in 2003 that provide the House with a stylish new look outside and myriad new amenities inside—all new student and public furniture, sparkling windows, a "street front" computer lab, a patio garden, café, movie screening room, three music practice rooms, dedicated library and study rooms and a dramatically redesigned lobby. The effect could not have been more dramatic, and welcome. Anyone who has seen Rodin College House lit up at night, full of activity and energy, can appreciate how it has redefined the skyline of Hamilton Village. From Center City, you can actually see it glowing. Rodin College House is configured as an apartment building, with seasonal air conditioning, private baths, and, in many cases, kitchens. Due to the apartment-style layout, Rodin's 820 residents enjoy a great deal of freedom and privacy, balanced by a healthy sense of floor community. They also enjoy spectacular views of Philadelphia and its surrounding area from the upper floors. The Class of 1920 Commons dining room is less than a minute's walk from Rodin, making it a convenient option for residents. When the College Houses were created, the office of College Houses and Academic Services sponsored a design competition called the College House Coat of Arms Project. 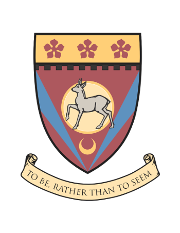 The goal was for each of the College Houses to have its own distinctive coat of arms that reflected its unique character. The coats of arms were designed by residents of their respective houses, and the designs were refined by a professional artist for use on everything from House letterhead to mugs, watches, and other items. Muhammad Zeeshan Amin (College '01) designed the winning design for Rodin College House. Here you can find the description of the arms and learn more about what it symbolizes. The three cinquefoils across the top of the shield signify the three high rises. They symbolize the hope and joy of residents, and the maroon color reflects magnanimity. The nebuly, or line below the cinquefoils, signifies clouds and air -- a tribute to the vistas seen from the heights of the high rises. 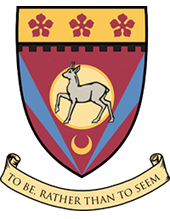 An inverted maroon triangle (a "pile" in engineering terms) dominates the shield, connoting the triangular pattern of the high rises in relation to one another and the engineering "feat" of 24-story buildings. A buck stands in the shield's center -- reflecting the peace and harmony of Rodin's residents, as well as their readiness to charge ahead. A bright sun lies behind the buck, and it is flanked by royal blue triangles that connote loyalty among residents. Finally, the crescent compliments the sun and stands for honor. The motto "To Be, Rather Than To Seem" instructs Rodin's residents to draw inspiration from the building's physical stature and become "higher, taller, more graceful and more outstanding" than mere appearances. The motto is in English rather than Latin due to the modernity of the House's architecture. Our House colors are maroon, royal blue, gold, and maize. You'll see our staff and residents wearing these colors at House activities.